When I was 5 years old, I learned the importance of saying, “Yes.” It changed my theology of ministry for the rest of my life. 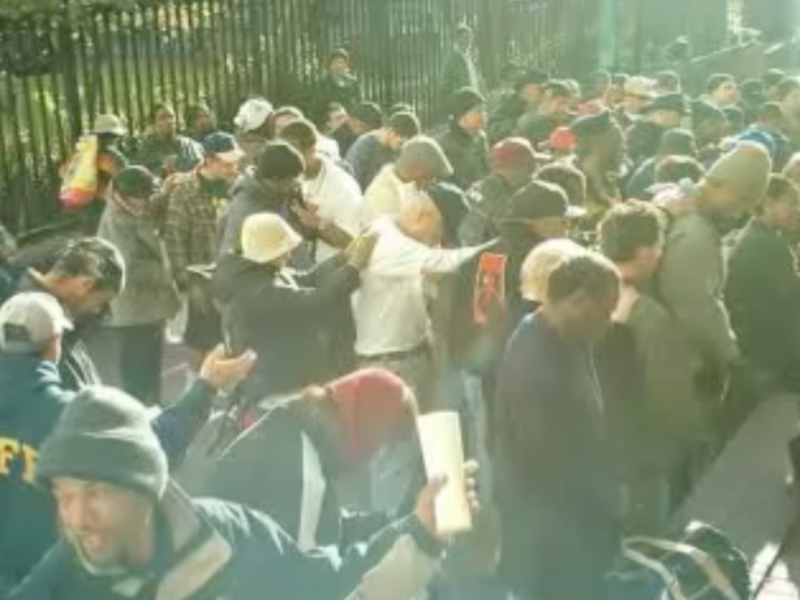 My family’s church holds services outdoors in a homeless-congested park in downtown San Francisco (we call it Church in the Park—be jealous of our creativity). My dad was setting up the sound system when he noticed a man far from the crowd, in a corner by the gate, looking down at the cement. As the man rose to get up, my dad handed me a Bible and a pamphlet about Jesus, and said, “Go, run, hurry-- give this to that man, say ‘Jesus loves you,’ and come back to me.” I replied, “Yes, Daddy.” And ran. 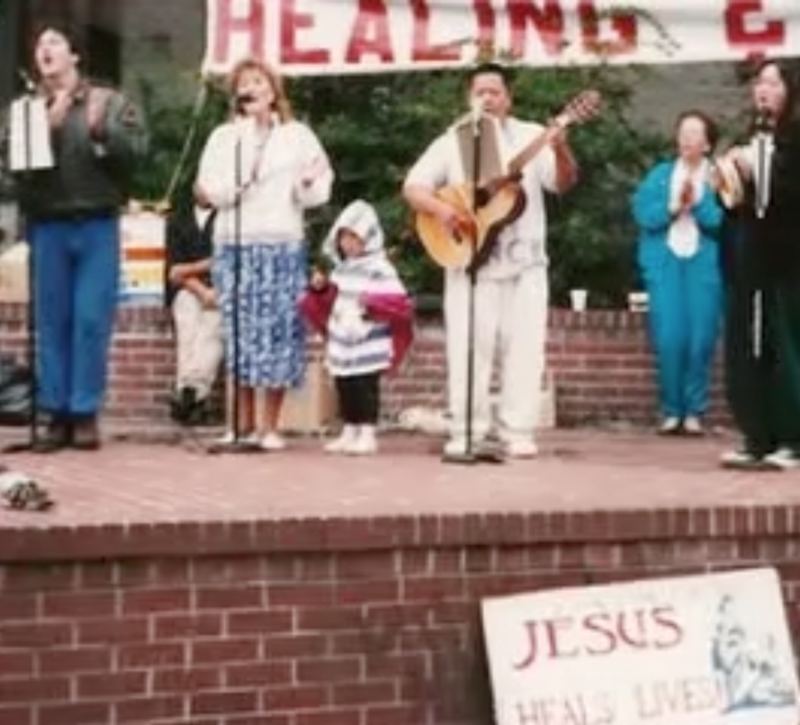 My dad leading worship through music at Church in the Park. I'm the little one, just hanging with my dad. I was 5. I had not yet discovered the beauty of rebellion, the questioning of advisement, or the distain towards authority. Rest assured, those glorious years were just around the corner, but at that moment in time-- at 5 years old, I had no reason to ever question my dad. I had a good relationship with my dad. If he told me to do something, I didn’t hesitate, I didn’t question him-- I didn’t need to know why he was asking, I just needed to say, “Yes,” and do it. Life was so very simple. Was there a time in life when we approached God this way? 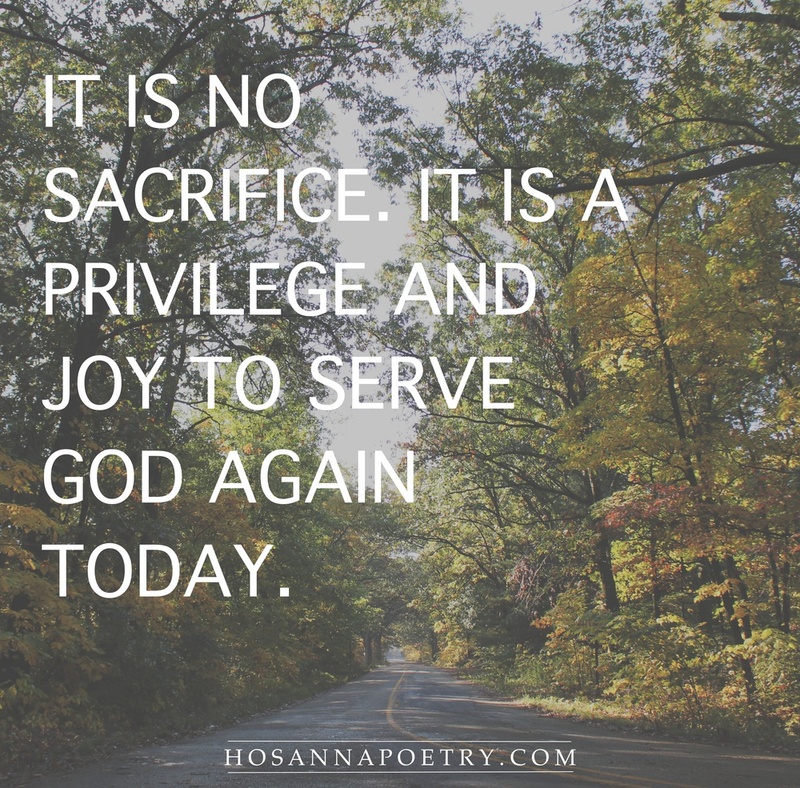 Was there a time when our desire to please Him was so deeply rooted within us, that when he asked us to do something, we didn’t hesitate—it was enough that he said to? Nowadays I find myself a part of a society that wants to analyze the call of God. When he says, “Go,” I want to know, “Why? What will happen?” When he says, “Go to them,” I want to know… “Why them?” When he says, “Hurry,” I want to look back, pause, question and figure out what the pros and cons are of me hurrying. When he tells me to do anything at all, I want to know first and foremost what the outcome will be. It’s no longer enough that He said to. Indeed, we have lost our theology of obedience. Many addicts, convicts, and prodigals coming to the Lord at Church in the Park. 1992. We’ve heard this. But do we get this? We know this by heart. But does that translate to how we live our lives? The Son of God came into the world to save us from eternity without God—the biggest event in our Christian history, and as he was going back to Heaven to be united with His Father, this call was in the last phrase He chose to say on Earth. This was the last thing He told us to do. That is a very big deal. Because let’s be honest, we’re not 5. We’ve had some trial and error. We’ve had some doubts about God. We’ve been exposed to rejection. We’ve had some lame authority figures. And as adults who have it all figured out and know what’s best for ourselves, someone merely telling us to do something, is rarely enough for us to get up and go. I remember running to that man on the street, handing him the Bible and pamphlet, skipping back to my dad and exclaiming, “I did it!” and not understanding what I did, or what the impact could have been. My dad would later tell me that night, and try to explain it to me in the years to come, the events that transpired that day. My dad smiled, and probably realized then what it took me years to see: the joy of ministry is not the joy of being patted on the back; the joy of ministry is the joy in obeying God. I didn't need to know the outcome. I just knew that he said to-- and me saying "Yes" made him happy. Years later, hanging out with my homeless friends at the release of my new album in downtown San Francisco. Decades later, as I live a life striving to obey this call, I remember this story. Days when I’m tired, days when I doubt my abilities, days when I want to analyze God and figure out why I’m doing what I’m doing, I remember this. I remember that man on the street. I didn’t know his story. But I ran. I didn’t know he had a gun. But I hurried towards him. I didn’t know he had the potential to turn his eternity around that day; I didn’t know the impact that small act would have on his life; I didn’t know why on earth I was running down that street. But it wasn’t my job to know. It was my job to obey. There are times we want to know the impact we have on people in order for our sacrifice and obedience to be worth it. I hope we get set free from that disgusting pride. I hope that you and I reconnect with this child-like heart of obedience. We don’t need to know why God is telling us to hurry towards people. We don’t need to know how we impacted them after. Life is actually, so very simple. We just need to say, “Yes.” Because He said to. Lives could be hanging in the balance, relying on us… to not hesitate. I grew up on the streets of San Francisco and spent most of my days hanging out with the homeless, drug-addicted, convicts of the city’s ghetto, the Tenderloin district. If there was one group of people I understood from a young age, it was the homeless. Not everybody had the same story or same life situation, but for the most part, the people I came across had nothing to their name—a few clothes on their back, a shopping cart of belongings if they were lucky, and they roamed the city with no place to call their home. When God opened the doors and challenged my heart to downsize my belongings, become a minimalist, forfeit having a home base, and start a traveling ministry, I knew exactly what it looked like. I knew what it meant to have close to nothing. In order to say, “Yes” to what I was challenged in my heart to do, I threw 2 closets and 3 duffel bags worth of clothes & shoes onto the floor and downsized to two suitcases. I sold & donated large amounts of childhood and college memories, including memorabilia from living in China, furniture, and other random items that once meant a great deal to me. In order to have this traveling ministry, I couldn’t take all of this stuff with me—it would get in the way of me going. Having so many things would weigh me down, and though some of them were extremely important to me, I couldn’t have both. Answering God’s call won out in the end. To this day, everything I own fits in the backseat of my car (about the size of a shopping cart). Chances are, we aren’t exactly alike—perhaps God is not calling you to minimalize your material things to be practically homeless (though minimalizing is incredible—I highly recommend it), traveling from state to state every week. But maybe there is other baggage that is weighing you down from truly embarking on the adventure God has for you. Maybe you need to dump your closets and duffel bags of scars, hurts, painful memories you hoard, and let it all go. Have you felt in your life, ministry, or relationship with God that you just can’t move forward? Maybe it’s because of all your stuff. If we want to obey God, we can’t take it with us. 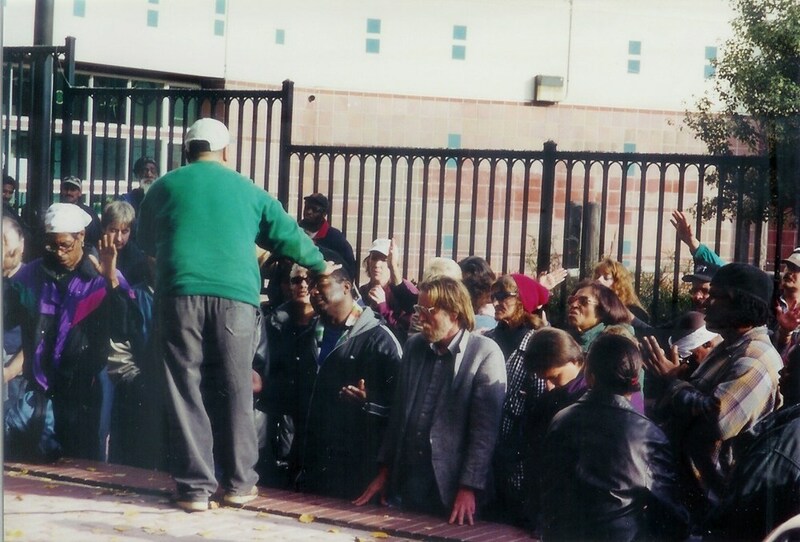 I’ve watched thousands of homeless men and women on the streets of the Bay Area surrender and give their lives to Christ. The reckless abandonment they embody as they throw their heroin needles on the ground and kneel in tears crying out to God is unlike anything I’ve ever witnessed in a conventional church setting. Maybe it’s because they have nothing else. Maybe it’s because they have to have Jesus. There is nothing else to fill the void in their hearts; they are desperate for a Saviour. I want that. I want that desperation for Jesus. I want to throw my pain and hurts on the ground and cry out to the Lord—fully aware that He is all I need, fully aware that I have nothing without Him. I’m convinced God is calling us to be "homeless"—to not rely on any person, material thing, or earthly identity to define us, but to be rid of all that we put before Him. He is calling us to not hold tight onto our possessions as if they are our home, to not collect our scars as if they are our identity, and to not allow our baggage to weigh us down when God has something new for us. Our home is not here. Our home is far greater of a place than we can possibly imagine. And if we hope to be there—if we hope to recklessly worship God there one day—then we must know, all of our stuff: we can’t take it with us. Let us be identified by our true home—it’s not here. Let us let go of the load we’ve been carrying—isn’t it heavy? If we want to walk down a road of healing & restoration, we can’t take our past with us—don’t we want to be empty enough for Him to fill us? Let’s be rid of the old—so He can do a new thing. A major wall I hit when the telling my world about Christ is that I am filled with fear. Filled. I fear being rejected. Or worse-- being rejected on a platform where everyone can see. I fear being laughed at. I fear trying anything—hoping for anything, and then failing. Oh, how I fear failure. I fear like my life depends on it. I fear like my reputation depends on it. My reputation is most definitely at stake-- the more I try to talk about a man whose life, and death, and life again is a symbol that we are innately broken and messed up and we need a Savior. No one wants to hear that. Every other day I don’t want to hear that myself. And I fear the world thinking I’m socially ignorant, rudely forceful, or blindly religious if I mention something like salvation, or hint at someone like Jesus. These fears used to drive me. And then something happened. I went out on a limb—it was horrifying— and left my selfish, self-righteous, hedonistic self behind, and I sacrificed my comfortable world to use whatever gifts I had to tell people about the hope I had found. I let myself be seen for the world to ridicule, make fun of, and allowed myself to reach in ways that would be obvious if I failed. And you know what happened? All of my fears came to pass. I lost friends. I lost respect. I’ll be honest—I lost cool points. I was excluded. I was publicly humiliated. And I failed a ton of times. Greater than my fears of being rejected, losing friends, or being out casted-- I fear people dying without knowing Jesus. I fear that there is something I know that can save people from an eternity separated from a loving, joyful, compassionate God, and that they will never know Him—never experience Him— if I don’t speak up. Indeed, I have found a fear greater than all my other fears. My theology on evangelism is not “Be fearless!” On the contrary, I am filled with fear. I am afraid for my friends that do the same disgusting, demeaning things I used to do not knowing that Jesus could change their life around. I am afraid for the prostitutes in Amsterdam who are traded and trafficked never knowing that they are fearfully & wonderfully made. I am afraid for the strangers walking by me on the street always being strangers and not spending eternity alongside of me as I worship God for forever. Oh, how this fear fills me. I fear like their lives depend on it. So what do you fear? Are you like me? Rejection, loss of relationships, failure? Now what do you fear more than those things? Do you fear people never knowing the life-changing Salvation you have come to know? Are you afraid that perhaps you have a gift or talent that could make the difference in someone's eternity if you hoard it in? Do you fear people existing for a moment, if not forever without Christ? Do you fear enough to move your feet? God, help us to fear for them, more than we fear for us. May we live our lives in this fear. After all, our reputations can’t possibly be as important.